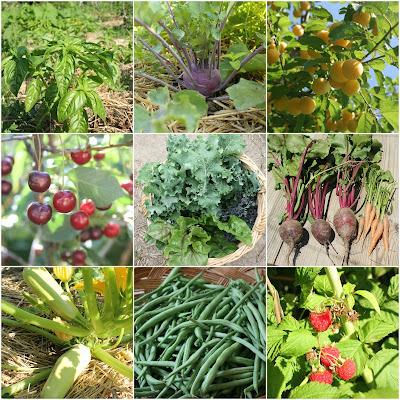 In terms of individual crops there have been some pleasant surprises in the garden this year as well as some disappointments. My favourite plant so far this season has to be the Dwarf Bean cultivar 'Roquefort', delivering plenty of delicious golden-yellow pods 15 - 18 cm long, excellent in salads and when cooked. Dwarf Bean 'Roquefort' great for filling gaps between "cut and come and again" greens or low growing beetroot and Kohlrabi. Another excellent french bean - 'Cobra' (a climber) that continues to produce all season, grows brilliantly in our home garden year after year. It's not been doing so well in the market garden the last few seasons with very low germination rates, although the ones that do make it don't let us down. Kohlrabi 'Purple Delicacy' are also doing well this year and is definitely something we will grow more of in the future. They seem to be enjoying the shade provided by the Paulownia saplings, as do the Parsley plants. Ares - Paulownia tomentosa 'Shan tong' providing shading for Kohlrabi and Parsley. The giant leaves also make excellent mulch, preventing weed competition and enriching the soil. Tomato Woes - The tomatoes slowed by a cool and wet spring have caught up during the hot June and July weather, but many of the plants showed withered leaves and growth defects. 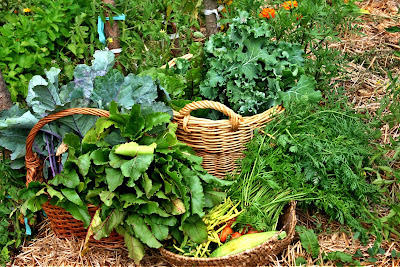 The problem seems to be widespread in the town although I'm happy to say our home garden plants are largely unaffected. I thought at first it might be one of the wilts, Verticillium or Fusarium fungal pathogens that can seriously damage/destroy a tomato crop, but the symptoms do not match entirely. Although the plants look terrible, growth continues with many flowers forming but none of the flowers appeared to be forming fruit. We considered pulling the plants but decided to watch a little longer before acting and it seems as if fruits are forming now. Comfrey Fertilser - Comfert is a liquid fertilizer concentrate from Comfrey leaves that we grow on site for applying to our crops. "Comfert" is made by packing fresh-cut comfrey tops into an old bucket, weighing them down, covering tightly, and waiting a few weeks for them to decompose into a black slurry. We dilute this comfrey concentrate 1 part comfert, 15 parts water, and apply a minimum of 500 ml to each tomato plant that is setting fruit or any plants that look like they need a boost. A word of warning! If you get comfert on your hands you will literally have to wait for your skin cells to shed before you get the smell off. I'd describe the smell as a rotting vegetarian cat and recommend wearing gloves! Comfrey - Symphytum x uplandicum 'Bocking 14' - smells great btw. As a rough guide, a single cutting from a healthy Comfrey 'Bocking 14' plant of approx 1.3 m height and 80 cm width can produce around 3.5 L of comfert dilute. 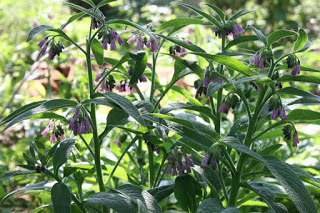 For more on Comfrey see our previous post here. Kata and Natasha donning latex gloves to apply comfert to the toms in 500 ml yogurt pots. All products in our boxes are grown from our gardens. 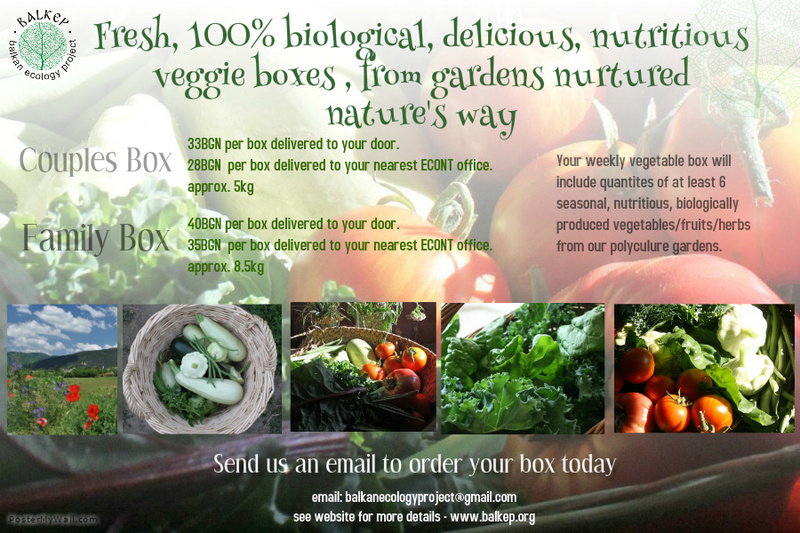 For more information see our webpage here. Each week we also offer a range of herbs, fruits, vegetables and plants via the excellent platform of Trustika food co-op. The last 3 years we have been gathering data to look at the inputs and outputs of our gardens (see here). 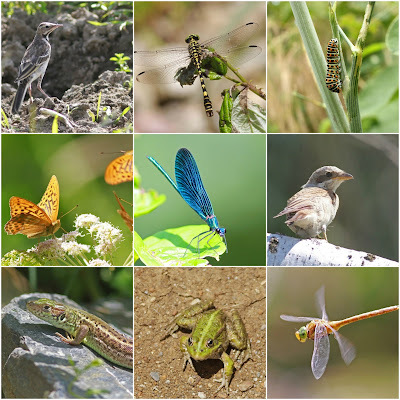 We'd also like to build a picture of the biodiversity associated with the gardens and this year we are beginning to explore this with three entomological surveys headed up by my brother Peter Alfrey. June saw the second survey of the year, Thanks to everyone who took part. A few snaps from the survey. More info on the biodiversity study. Living Fence - We've been growing a living fence on the northern boundary of the garden composed mainly of Robinia psueodacacia. 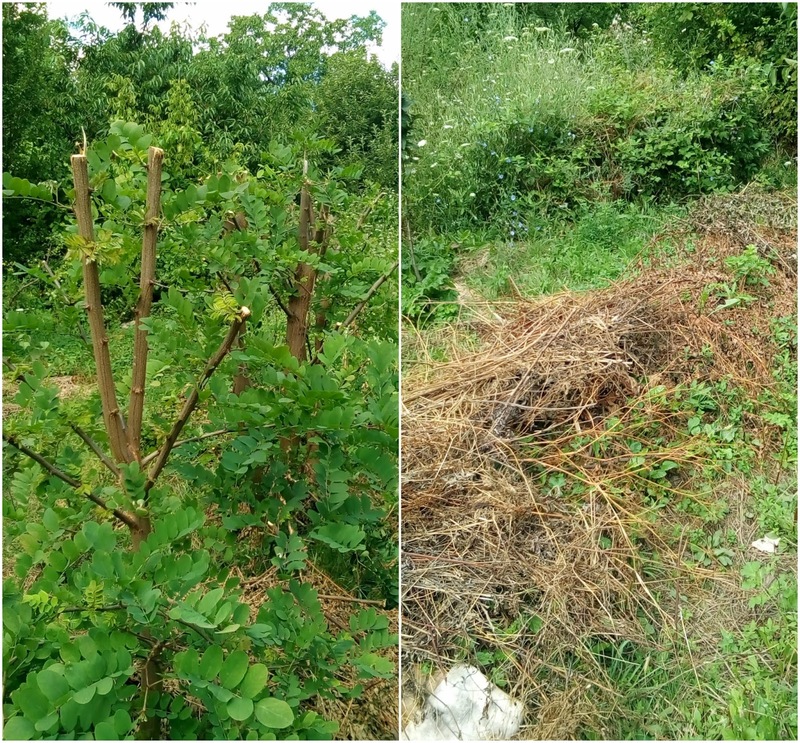 The purpose of the hedge is to function as a boundary, a windbreak, nitrogen fixation and biomass souce for use as mulch in the forest garden. 5th year Robinia pseudoacacia flowering profusely in May, excellent bee forage. 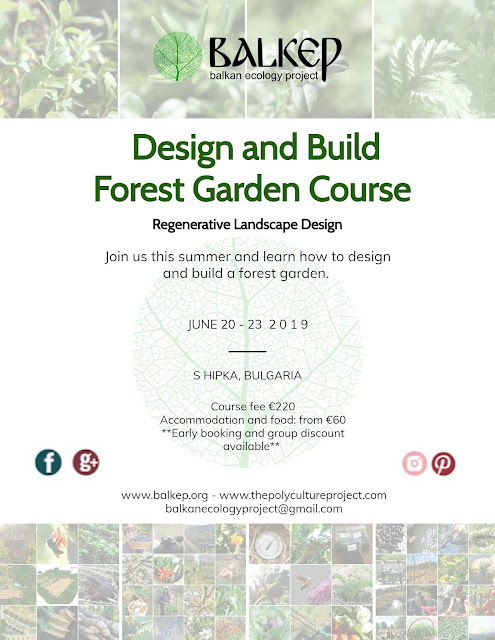 The trees have grown incredibly fast and in five years have formed a dense upper canopy on the boundary of the forest garden that is beginning to cast a heavy shade on the newly planted hazelnuts, plum trees and blackcurrants in the lower canopy. We want to maintain the border and windbreak, but also want to allow more light in to reach the lower canopy and shrub crops so we reduced the height of the trees to 2 m high. This autumn the plan is to fill the gaps between the trees with raspberries and currants, and prune annually or biannually to keep the height low and provide plenty of biomass for mulch. Left - hedge following reduction. The five year old trees provided some good round wood timber and plenty of leafy herbaceous material that we use for mulching perennial crops or preparing new ground. Pruning Prunus - Other tree pruning work we carry out this time of year includes lifting the lower limbs of Prunus spp. such as Cherry Plum, Sour Cherry and Damsons to allow more light into the shrub layer and better access within the garden. Summer is the recommended time to prune members of the Prunus genus i.e Plums, Almonds, Apricots, Nectarines, Peaches, Gages etc. The reason for this is to minimise the risk of silver leaf infection. Silver leaf is a fungal disease and its wind-borne spores are released from late autumn through to spring when they can enter fresh pruning cuts. Watering Young Trees - July is always a bit sparse on fruit in our forest gardens. 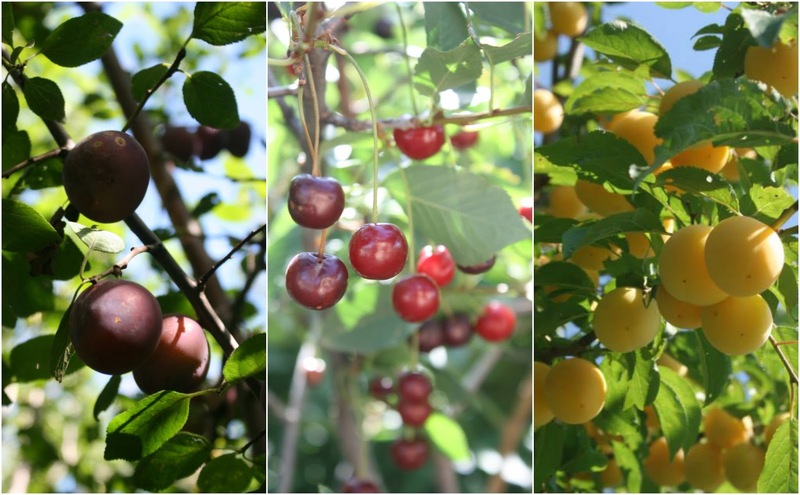 There are plenty of wild Cherry Plums, Damsons and Sour Cherries in and around the gardens but we could be enjoying a lot more variation so last year we planted early fruiting Apricots, Pears, Jostaberry, Cornellian Cherries and some old Bulgarian plum cultivars. With no significant rain for the last 14 days we applied a good 20 L of water to the newly planted trees, weeding out any plants that have managed to grow through the mulch and topping up the mulch where necessary. We'll repeat this watering schedule every 10-14 days without rain until late September and for the following 2 years, after which time the trees should be able to find sufficient water.